That The Descendants is the weakest film of Alexander Payne's career says far more about its creator than it does about the film itself. Since his debut, Citizen Ruth, Payne - alongside his frequent co-writer Jim Taylor, who only serves as a producer on The Descendants - have specialised in a particular brand of wry, acerbic comedy that has produced the great triumvirate of Election, About Schmidt and Sideways in relatively quick succession. The Descendants lacks the hard edge that made so many of Payne's previous work so distinct and funny, but that does not mean that it is without its own charms. Matt King (George Clooney) is a lawyer struggling through a profound personal crisis. As we are informed via the film's fairly intrusive voice over, his wife has spent the last month in a coma following an accident during a boat race. 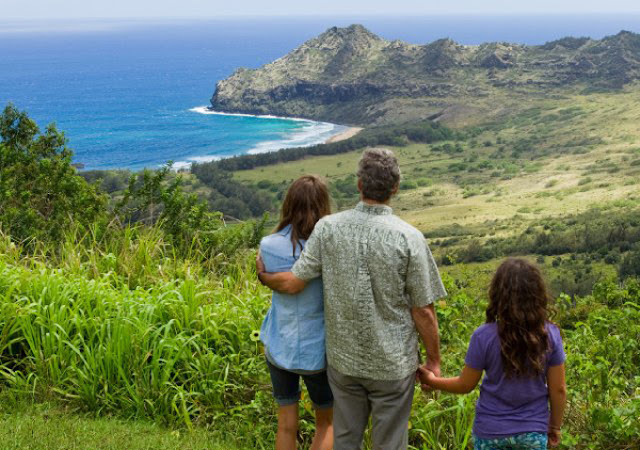 At the same time that Matt is spending every spare moment at his wife's hospital bedside, he is also overseeing the sale of 25,000 acres of the island of Kaua'i, which has belonged to his family for hundreds of years and of which he is the sole trustee. After being told that his wife is never going to wake up, and that she is going to to be taken off life support, Matt begins the process of telling the various friends and family members about what is going to happen, at the same time trying to figure out how he is going to cope without the love of his life to help him raise their two daughters, Alexandra (Shailene Woodley) and Scottie (Amara Miller). The Descendants starts with a rush of exposition delivered in voiceover which is both overwhelming and underwhelming. The amount of information delivered, telling us about the various cousins who have different interests in the sale of the family land and explaining the premise of the film, is a little much, but it's also really plainly written and obvious. Payne's films have used voiceover in the past, most notably in About Schmidt, in which the letters Jack Nicholson writes to his pen pal served to illustrate his inner thoughts, but it was handled much more artfully in that film than here. The key to About Schmidt's narration was that it revealed things about Warren Schmidt without actually saying them: the importance of it lay in the way that he would make his life seem better than it was, inadvertently revealing the sadness of his character. In The Descendants, the narration serves no purpose other than to reveal a lot of information quickly, after which it is completely abandoned and the film moves into its far stronger second and third acts, when the script by Payne, Jim Rash and Nat Faxon engages with the emotions of the characters in a far more nuanced fashion that does not rely on the crutch of narration. The most interesting aspect of The Descendants is its milieu, since the film offers an image of Hawaii that is completely divorced from the traditional imagery of luaus and surfing. Setting the story amongst the equivalent of the landed gentry of the stated provides a fascinating insight into the lives of a class that I, for one, was not aware existed. The lives themselves are not especially revelatory - they have their tragedies, their infidelities and their crises the same way that every one else does - but the film does a very good job of getting across the weight of the past on Matt and his family, both in terms of what their ancestors did in order to gain their vast tracts of land, and with regards to the actions of Matt's wife, which come back to haunt him long after he is able to confront her about them. The other great strength of the film is the depiction of Matt's family. Clooney, playing his age for once, spends much of the film struggling to keep his head about water, and the mixture of love and frustration he shows towards his daughters feels very real. Clooney's rarely been more convincing than he is as a man who is struggling to understand what is going on around him, constantly reeling from the tiny ways in which his life is falling apart. Shailene Woodley, meanwhile, is wonderful as Matt's oldest daughter, Alexandra, who is introduced as a typical tearaway but who gradually reveals more layers as the film progresses. The film also manages to squeeze in some fine supporting turns by Matthew Lillard, Robert Forster as Matt's father-in-law - who manages to have both the funniest and most moving moments in the film - and Beau Bridges, who shines as Matt's cousin Hugh, an affable guy who hides a steely resolve whenever the land deal is mentioned. As I mentioned at the beginning, The Descendants is Alexander Payne's weakest film, but all that means in actuality is that it's merely very good, rather than excellent. It's a sweet, heartfelt film about the nature of grief which moves at a slightly sleepy pace befitting its location, and which ultimately manages to deliver a sly, yet powerful emotional punch.